Bar interior includes shelving, pull-out drawer, racking for individual bottle storage, as well as an x-rack that can be removed to accommodate a fridge. Create a luxurious wine experience with our Altus Wine Bar. 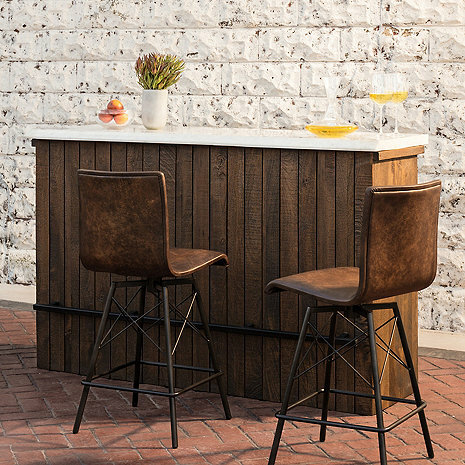 The sleek, marble bar top is paired with weathered, brown hardwood to create an elevated look that is warm and inviting. Bar interior includes shelving, pull-out drawer, racking for individual bottle storage, as well as an x-rack that can be removed to accommodate a fridge. Does this require assembly or does it come assembled already? What does the bar top assembly entail? The white glove delivery includes assembly. However, if it's going up or down stairs that will cost extra. Could you put two together to create a longer bar?